This level has medium difficulty. 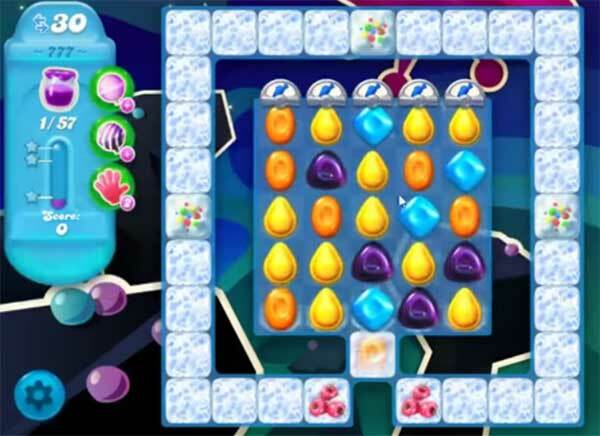 For this level try to play more from middle part of the table and try to combine more purple candies to get more special candy from them. Or use striped candy to break corner blockers to spread more jam. Or play more near to jam to spread it to near candies. This is hard. Getting frustrated! I might quit this game because of this Level! Have been stuck awhile and don’t see how I can beat it. I have used extra fishes etc. Maddening!!!! I Hav tried every move I can think of. I knw it can be won but u need 2 be more clear on tips not fair 22 Hav 2 repeat plays for as long as a week. mijn 777 level is ook nog eens gevuld met dropjes. ik kan nergens een filmpje vinden met deze dropjes erbij in? wat ik ook gebruik.. ik kom amper in de buurt van een slagings kans? help me please? Hey gibt, Sie haben eine fantastische eine unglaubliche Arbeit. Ich werde definitiv sicherlich Digg und persönlich empfehlen vorschlagen, zu meinen Freunden. Ich bin sicher, sie werden von diesem profitiert werden.